“The mass of men lead lives of quiet desperation.” It’s one of Henry David Thoreau’s most-cited (and most often misquoted) aphorisms. But what precisely did Thoreau mean by this sentence? Was he attempting to capture the feeling of disconnect that defines the human condition? Was it an observation of the perpetual dissatisfaction that’s generated by existing within a capitalist society? Or perhaps the writer was expressing a surprisingly empathetic assessment of the broader world from which he had chosen to withdraw? For a long time, it was open to philosophical debate. But no longer. Now we know for sure: Thoreau was referring to Wisconsin Governor Scott Walker’s Instagram feed. What makes his photos so simultaneously compelling and unnerving is that, for the most part, they feature everything you expect of an Instagram account. He photographs food. He photographs “events.” He photographs presumably enjoyable activities. And yet, Governor Walker insists on focusing on the least appealing part of his experience every single time. The evidence is plentiful. Behold, just a few of the seemingly endless parade of brown paper bags containing Governor Walker’s lunch. To be fair, that second one actually contains the image of his ham and cheese sandwich, too—though, as is soon revealed, that’s about all Scott Walker eats, day in and day out. “Even on Election Day.” The morose bluntness speaks volumes. Scott Walker’s on a flight? He’ll take a picture of the safety card. Working out at the gym? Enjoy a closeup of his water bottle. A beautiful morning on a picturesque lake? Fear not, Walker is there to capture the plain wooden slats upon which his feet must forever tread, eyes to the ground. Yes, Scott Walker is one of the modern era’s great unappreciated artists, though his art suggests he likes it that way. Only by maintaining fealty to the minute agonies of pedestrian existence can he perfectly convey the endless internal agony of our regimented and constrained lives. 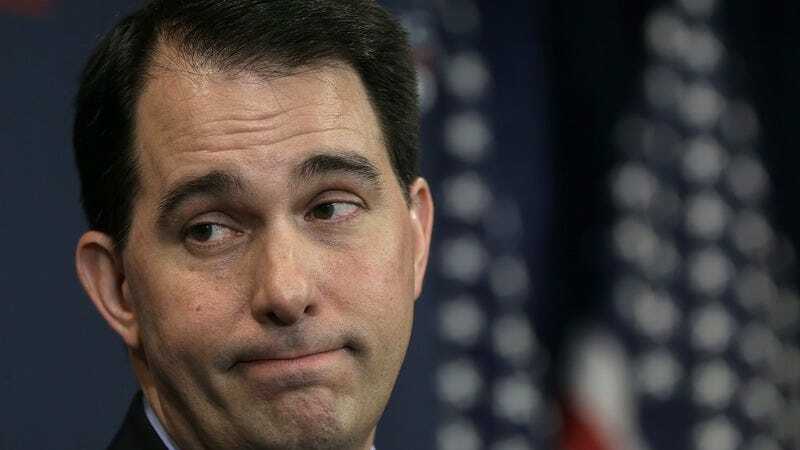 Scott Walker’s joy has died for our edification. Look upon his works, ye mortals, and despair. Also, he goes to Cold Stone Creamery and orders plain vanilla with no toppings or mixings. Truly, the ascetic of our times.